He's not the son of messiah he's a very naughty boy and with that said, The Immaculate Edition of The Life of Brian arrives on DVD which is one of the funniest and most memorable Monty Python movies of all time. The story revolves around Brian who was raised in similar circumstances as Jesus Christ, even being born in a stable on the same day. This hilarious comedy movie features Brian as he becomes mistaken for the messiah throughout his life and features one of the most memorable comedic songs of always look on the bright side of life. 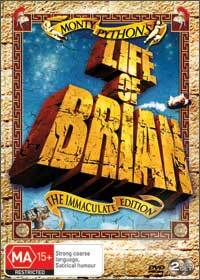 The Immaculate Edition of the Life of Brian features remastered video and audio quality, making this the definitive version of the movie with a plethora of entertaining and informative special features with audio commentary by the Monty Python team and a variety of deleted scenes and great radio spots.